Meet Flinn Echerie. He is a Brutix pilot who lives in highsec. He is the founder, CEO, and sole member of his own highsec industrial corp. He is also engaged in rebellion against the New Order. Now, I know what you're thinking: "Is he crazy, resisting the Code? 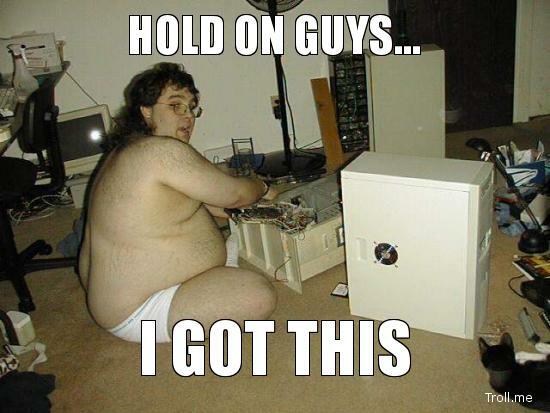 This guy is obviously going to get himself ganked." A reasonable assumption. But today's story has a surprise ending. 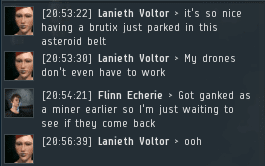 Fellow miner Lanieth Voltor praised Flinn for protecting the asteroid belt with his Brutix. When she had to leave, Flinn assured her that he would keep the belt safe in the meantime. Again, I know what you're thinking. You assume that Flinn's Brutix is going to be blown up, because that's the fate of everyone who stands in opposition to highsec's ruling elite. I would ask that you put those preconceptions--no matter how strongly held they may be--aside today. This story is going to be a little different. You see? A few minutes later, Lanieth returned, and the carebears' conversation continued. Nobody died. Incidentally, this conversation is typical. Because of the New Order, even bot-aspirants are driven to speak in local from time to time. 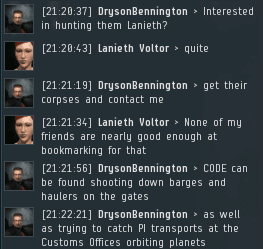 The miners shared stories of being ganked by our Agents. Flinn declared himself an enemy of the New Order and bragged about his plans to avenge his mining barge's death, and to facilitate the illegal mining operations of others. Once more, I would caution you against the presumption that this story will end with Flinn getting ganked. Keep an open mind. The world can be an unpredictable place. Just because the rest of the stories ended that way doesn't mean this one did. Flinn did not get blown up immediately after announcing his intention to seek revenge against the Order. Instead, the carebears simply continued their little chat in tranquility. ...and then the Brutix got blown up. "I knew it! ", you say. Indeed you should know it. It is inevitable that every man, woman, and child who violates the Code will be brought to justice. There's no escaping it. You did well in predicting this outcome. However... Did you, at any point, scroll to the end of the story, looking for the killmail, just to make sure? If so, you showed some signs of doubt. 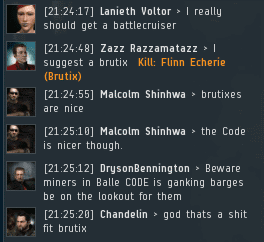 If you knew the Brutix was going to be ganked, you wouldn't have needed to scroll down. Keep working on that faith in the Code. But I did promise a surprise ending to the story, so let's have a look at that Brutix. Was it fail-fit, like all the other anti-Order rebels' ships? Or did this rebel manage to put something decent together, for once? The Brutix was completely fail-fit. Of course. What was the surprise ending? Flinn was surprised when he got ganked. Rebels and bot-aspirants always are. They truly believe that their story will be the one that ends differently. 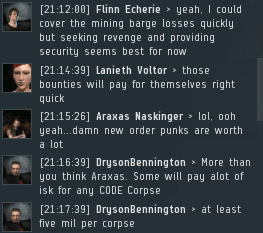 Countless miners have been ganked and punished for their resistance, but they think--for no particular reason--that they will escape the same fate. Hopefully this post was an illustration of the futility of that belief. The New Order always wins. Bwahaha. Well played, Supreme Protector. You had me at the edge of my seat. At least he fit a point? Tell me someone at least tried to take that poor clueless person under their wing? Ah the rare triple-rep fit. This is even rarer.. a quadruple rep. Check the high slots. 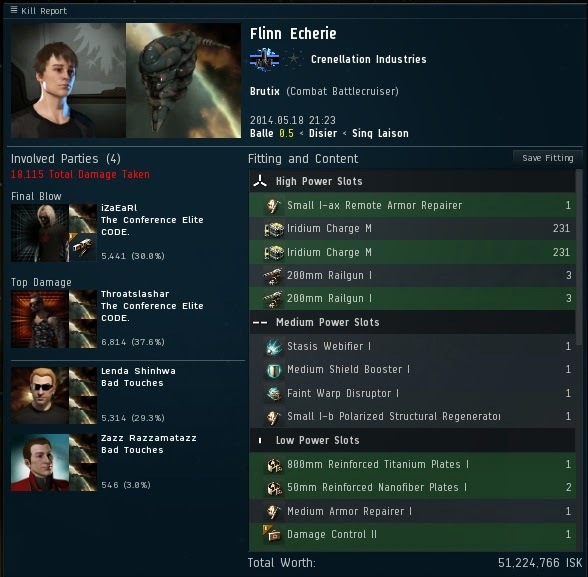 To be fair, I have seen viable triple rep fits for gallente ships. Just... Not THAT type of triple rep setup. He's bold for fitting quadruple reps, and bolder still for violating the Code. I was hoping the brutix was gank fit and was gonna start blasting those heretics! Yeah, I was hoping it was a ploy to hang out in a belt saying "Don't worry, you're safe with me!" and then ganking miners as soon as they go afk. This needs to be done some point. I agree, I thought that Brutix would gank something. I've seen better fits than that. But Flinn is just the beginning. No. I don't care what evidence you show me. You can't convince me someone actually did that to a Brutix. That Brutix was so bad im actually surprised he didn't put cargo rigs on it to finish off his masterpiece! Hmm...I never thought about jumping POCO to POCO looking for AFK PI haulers...thanks Dryson! 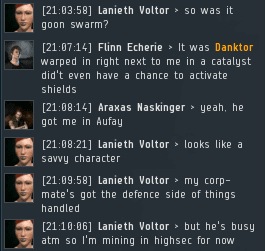 I hear that some of the miners are coming up with some fits that can possibly survive a gank. I don't have the fittings though. It is a slow evolution... but it is happening. Rail gun fit, doubled tanked brutix. Thank god someone put that abomination of one of my favorite ships to fly out of its poor misery.